I will be testing the distance of how far each type of paintball will go. First I will make a big ruler along a road area to see where it would land and then shoot (8 each) of normal, hot and cold paintballs. I will use a vice to hold the gun still so it does not modify anything. How does the temperature of a paintball inside the gun affect the distance it reaches? I think that the coldest ones will go the farthest because they are much harder and will go much faster since they wont be as squishy. (They will also be much harder to break). The warmer ones will probably be chopped apart by the bolt before it can even leave the gun. 1. Exactly what is a paintball? Paintballs are small gelatine capsules containing polyethylene glyco, other non-toxic and water-soluble substances and dye. Paintballs are made of materials found in food items and are edible, but taste horrible because they tend to dry up the mouth. 2. How does the temperatures affect the paintballs themselves? Well i’m assuming that if they are hotter, they will melt faster and be limited a very short distance. Also if the paintballs become hot enough, they will become very delicate and squishy, therefore they might be chopped apart by the “bolt” that shoots the paint balls. The colder paintballs will freeze the substances inside it making it lighter and harder to break, therefore making it go much faster. 3. What is the ballistics to a paintball gun? Ballistics is the science of how an object acts when propelled through the air. As applied to paintballs, there are a few firearms ballistics rules that apply, but only a few. Paintball ballistics are totally inaccurate. The round shape of the paintball causes the it to move slower whereas if it was a bullet with its conical shape it would have moved much faster. 2.While they are freezing, 2 hours would have past and I would return home from soccer. 3. After arriving to the area, I will set up the vice and area my gun will go and shoot some normal test paintballs to see where they would normally land. 3.Then I will use measuring tape to measure the distance, if I run out of tape I will mark off where I left and then continue from there. 4.After that I will spray paint the area that the paintballs would land. (So the paintballs can land and be recorded.) I will make a really big ruler basically. 5.While all this is happening my dad will be heating up the other paintballs with a blow dryer. 6. I will take out the cold paintballs from the freezer. 7. I will load the gun with the normal paintballs first then cold, then warm. 8. I will do 1 Test for each temperature. 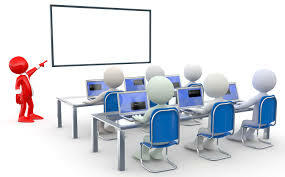 (I will shoot 4 paintballs in the test). 9. I will measure the distance in which each of the paintballs go. All the distances will be recorded from farthest to closest. Before I get into my conclusion, i’d like to state that although I would have much preferred my “Room temperature paintballs” the weather effected my regular paintballs and their temperature dropped to -2°. My hypothesis was incorrect because the normal paintballs went the furthest for the majority of the time. 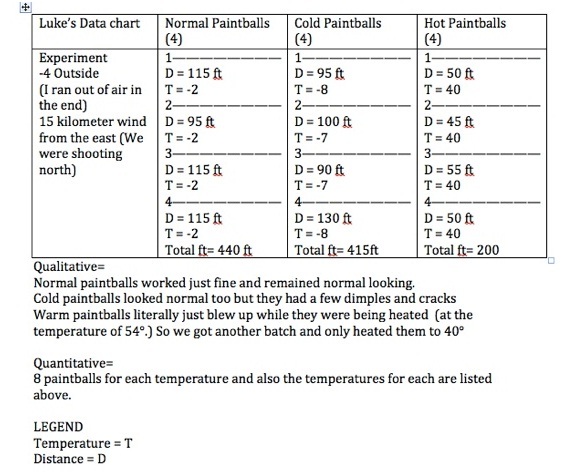 I thought that this whole experiment would be good to try out to actually see wether or not the temperature of the paintballs would really effect its performance. I was surprised because at first I thought that frozen paintballs would do the best. This is why I think the regular paintballs were the most consistent and the “best.” First of all the warm paintballs stood no chance against the two. Since the blow dryer did not work we had to improvise and use the trucks heater which worked very well actually. Anyways it was still a no brainer because while we were heating up the first batch, they blew up in my face. Then they didn’t go as far after we did a second batch. The cold paintballs didn’t do well because after they were frozen for so long, the liquids inside the shell hardened making it more delicate and there for easier to break/shatter. The normal did the best because they were the most consistent. Even though one of the cold balls got 130 ft the rest of the distances were much lower. If anyone thinks that they can modify the temperature to make it better, it will only make it worse. But I definitely can say it effects the paintballs. So everyone should stick to the regular paintballs so that you don’t have to risk it being chopped up by the bolt (The thing that shoots the paintball). This concept not only revolves in paintball but also in other sports. Take gold for instance, if you were to freeze the golf ball can it make an advantage? Or if you heated one up; this concept obviously can relate to many other sports. I think that the experiment worked better than it was even planned to. My dad’s ideas and helping definitely helped me get through this. If it wasn’t for him I wouldn’t get the results done basically, and that would have been a disaster. I think that I could have done a few things better, like planned way better and such. But anyways the project was a success and I am looking forward to handing it in. I hoped everyone enjoyed! 4. This is the dangerous power website. 5. This is what i mentioned on the research page!